Despite the arrival of services like Sling TV that are squarely aimed at a new generation of cord cutters, the ability to stream live television to mobile devices without an existing cable or satellite subscription remains elusive. The problem gets worse if all you want to do is complement services like Hulu and Netflix with local TV stations. The folks at Aereo were on the right track by effectively “renting” unique over-the-air antennas to customers. Unfortunately, the company was too forward-thinking and spooked traditional television networks so much they challenged Aereo in court, ultimately forcing them out of business. If you’ve already cut the cord and are eager to get those local stations back, there’s a new alternative that’s perfectly legal and devoid of monthly fees—but whether or not you can actually use it depends entirely upon where you use it. 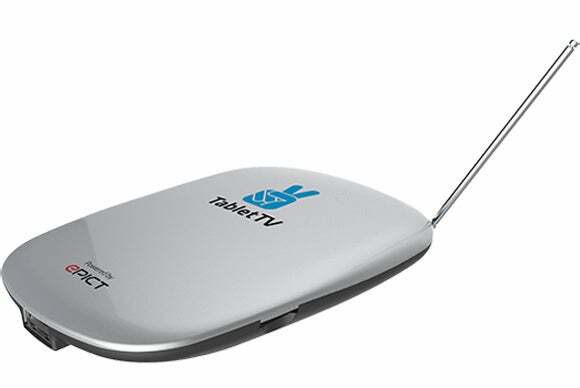 TabletTV delivers HD-quality live television to your iPad, courtesy of a Wi-Fi connected TPod tuner. TabletTV combines a small, pocket-friendly TPod with a free mobile app to deliver live television broadcasts to any iPad. Roughly four inches long, three inches wide, and half an inch thick, this grey puck includes a thin, retractable antenna capable of picking up over-the-air ATSC broadcast TV signals from VHF and UHF channels in your area. The antenna can be tucked away when not in use, and a sealed battery provides enough juice to watch for nearly four hours, recharging in about half the time. 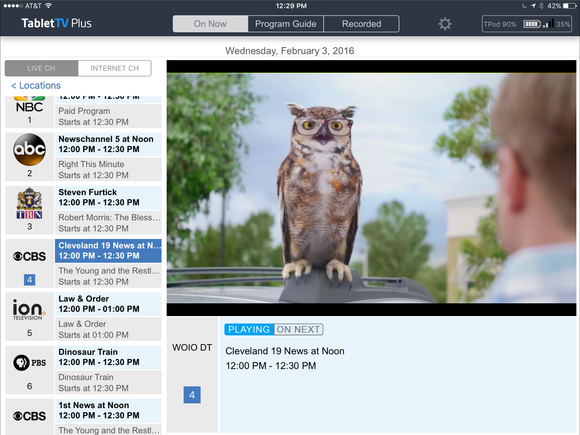 After registering your TPod with the free TabletTV Plus app, the device scans for available channels, which takes a little over two and a half minutes. After selecting a program, the built-in tuner then streams it to the iPad over Wi-Fi. Channels can be streamed without an internet connection inside a 30-foot range, or the TPod can piggyback onto an available network, where it can be used anywhere in the home. Only one tablet can be paired with the device at a time, so it’s not ideal for families with multiple iPads. 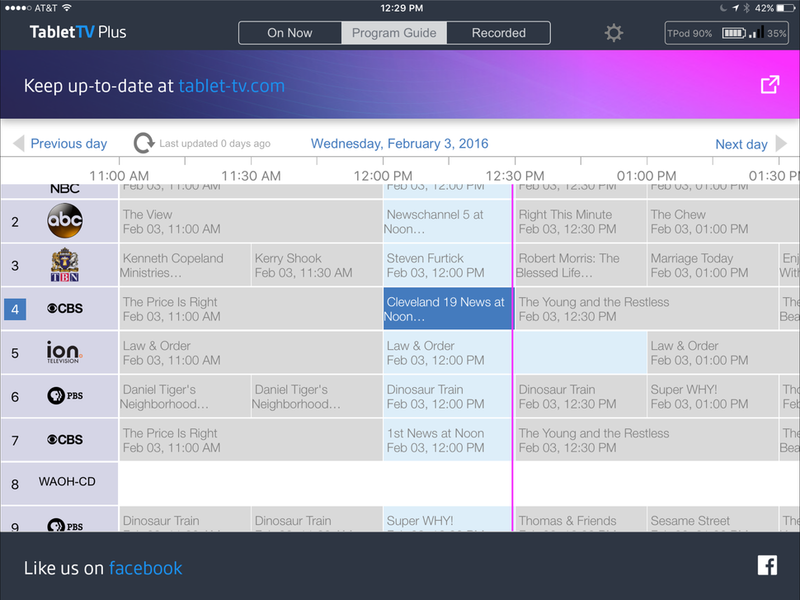 TabletTV’s electronic program guide works just like it does on cable or satellite. Selecting a show brings up additional information or the option to schedule a recording. TabletTV Plus works best when connected to the Internet so the app can download an electronic program guide of what’s playing for the next seven days, complete with title and a brief synopsis. This information was mostly accurate, but a few broadcasters with multiple stations often display channel data in reverse. Otherwise, the guide worked well and made it easy to skip to the next or previous day with just a tap. Although not entirely surprising considering the product name, TabletTV only works with iPad. There’s no iPhone or iPod touch support, a missed opportunity given the TPod’s diminutive size, which makes it an ideal travel companion. The app hasn’t been optimized for iPad Pro or iOS 9 multitasking so there’s no picture-in-picture support, but content can be beamed to an HDTV using an HDMI adapter, Chromecast, or AirPlay; the company says a native app for the fourth-generation Apple TV is also in the works. 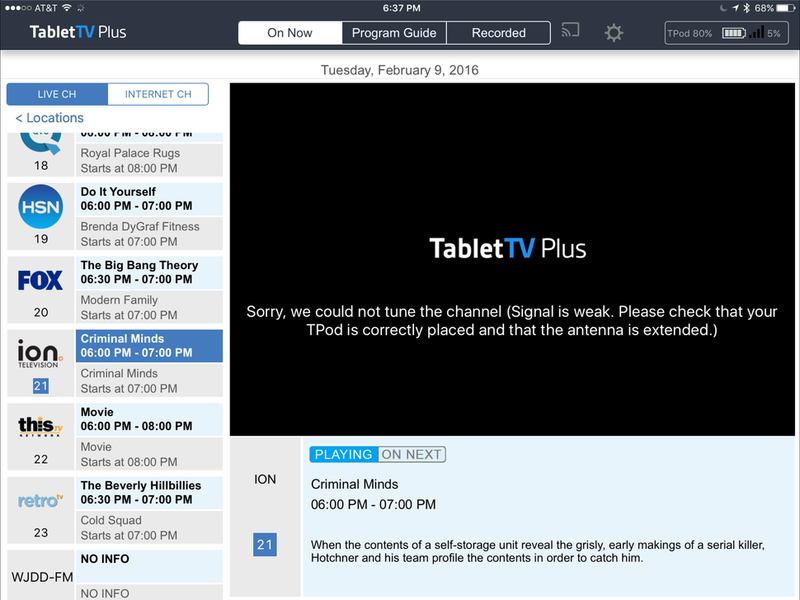 Like the ill-fated Aereo, TabletTV includes digital video recorder (DVR) functionality, courtesy of internal storage capable of recording roughly four hours of HD content. The TPod also ships with a removable 8GB micro-SD card, which can be easily swapped for a larger capacity as the need arises. 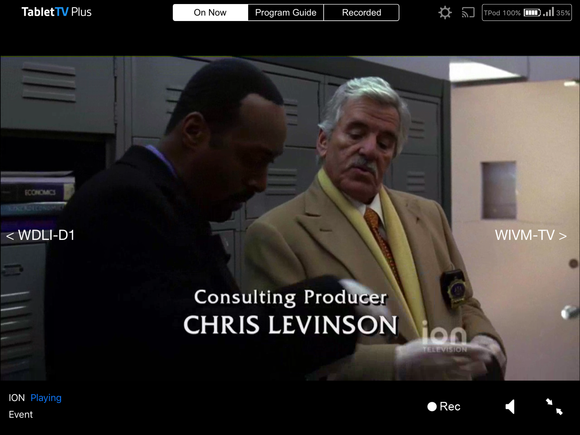 While in full-screen playback, TabletTV Plus users can skip to the next or previous channel, or start recording the current program. Recording is done by tapping a button from the On Now tab while a broadcast is playing, or by scheduling in advance from the Program Guide. Recorded content can be copied to the iPad for offline playback when the TPod isn’t available. Saved programs can’t be played back while a new recording is in progress, nor can viewers channel surf at the same time, due to the TPod’s single tuner. When used in an area with more than 50 percent signal strength, TabletTV provides a fairly clear, hiccup-free picture, particularly with HD channels. The decision to buy ultimately comes down to where you live: I’m located about an hour south of the nearest major city with towers for the four biggest networks, so my channel selection was limited to PBS and 25 other oddball stations. After driving a little further north, I had no problem picking up broadcasts from the local ABC, CBS, NBC, and FOX affiliates. A new channel scan is recommended after moving to a different location, but viewers can choose to use the previous one instead. Even when new channels are successfully added, there’s no guarantee they’ll be strong enough to actually work, displaying a “signal is weak” error instead. The TPod also needs to remain stationary while in use—even when placed on the dashboard of my SUV with a clear view of the sky, broadcasts cut out once the car started moving. Even if a channel is recognized, TabletTV may not be able to play it unless the signal is strong enough. Assuming you live in a geographical region with good reception, TabletTV is an inexpensive, subscription-free way to bring local TV stations to your iPad; updating the app for iOS 9, iPhone, and native Apple TV support would make it an even better value.